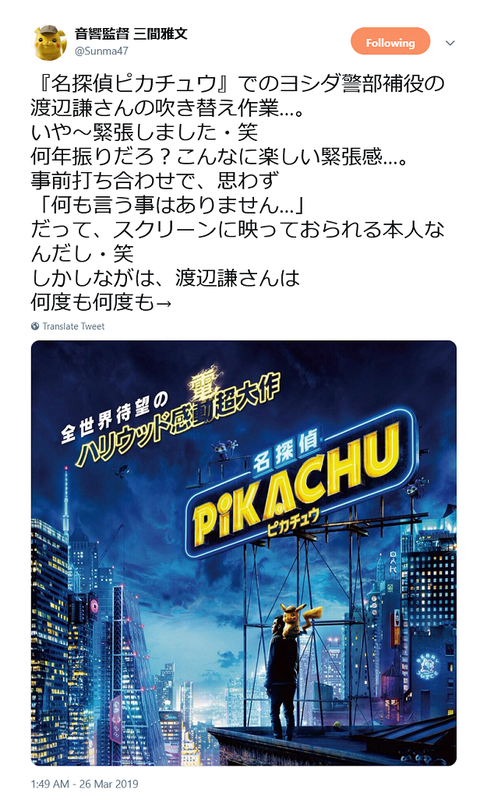 Tweets and other comments made by the film's production staff help give us a behind-the-scenes look at the production of the film. 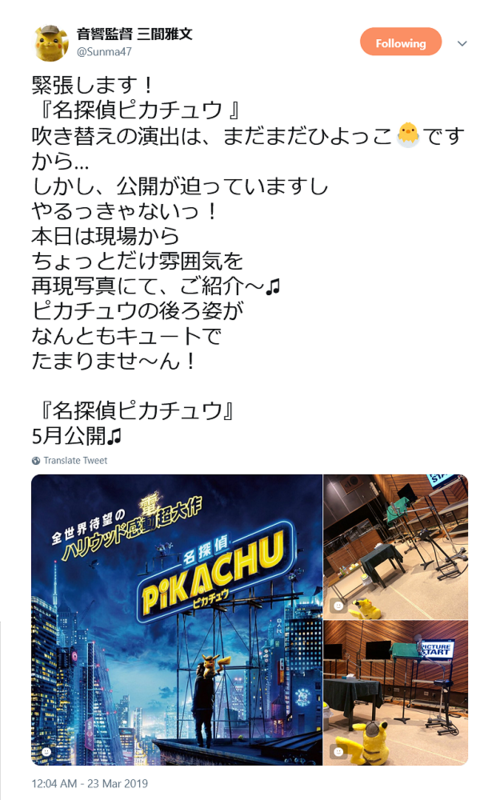 On March 15th, 2019 Mr. Masafumi Mima, the sound director guy for pretty much everything Pokemon, announces that he's going to be a part of the Japanese dub of Detective Pikachu as well. I'm going to work on it! I wanna hurry up and see the finished movie already～! I'll keep you updated on the sound work later～! So look forward to it ～! Coming to theaters this May! 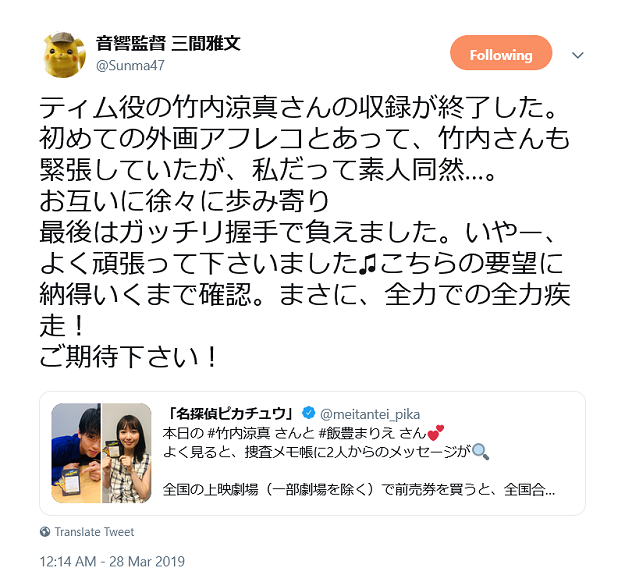 The movie Sing that Mr. Mima's talking about here is that 2016 Illumination film starring Matthew McConaughey, Scarlett Johansson, John C. Reilly, etc. about a group of animals entering a singing competition. Mr. Mima was the voice director for the Japanese dub. so we'd better get to work! As production of the Japanese dub is now fully underway, Mr. Mima tells us about dubbing with Mr. Ken Watanabe. I'm actually really nervous lol. How long has it been since I've felt this fun kind of nervousness...? "We don't have anything to talk about..."
Well, he did play the guy up on the screen he's doing the voiceover work for, after all lol. He really did his best to visualize his performance and give it his all! I'm so grateful to him. Thank you. I feel honored to be allowed to work on the same movie as you. We had a lot of fun together but it was over before we knew it. 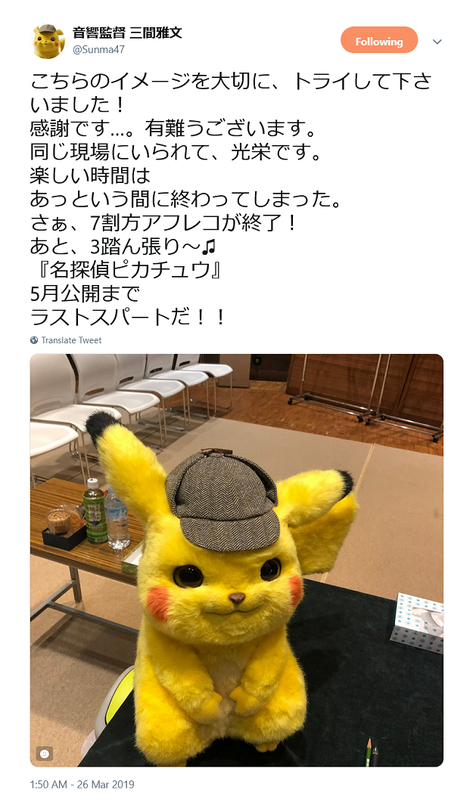 Well, I guess about 70% of the dubbing work is done now. I'll do my best on the remaining 30%! 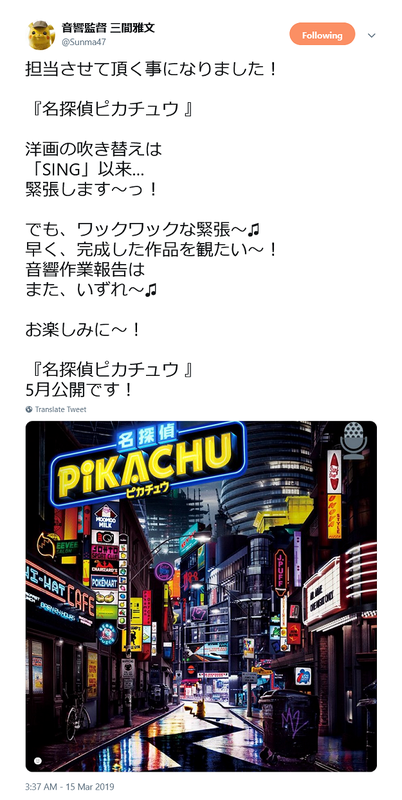 the May release of Detective Pikachu! So the two of us met halfway and gave each other firm handshakes to help us get through this. That Takeuchi really gave it his all. ♫ Now I have to go back and check to make sure everything's the way we want it. We're really running on all cylinders now! More comments will be added as they become available.